Welcome to the website of the Chair for Laser Physics! 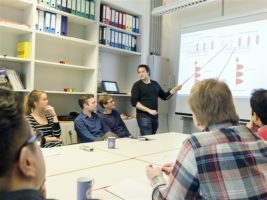 At the moment we work in three main branches of research that combine the topics of laser physics, quantum, electron, and nano optics, strong-field and attosecond physics, plasmonics and solid state research. We investigate the wave and particle properties of electrons in ultrafast processes in and at nano objects; we develop new particle traps to create quantum optical systems in order to build a quantum electron microscope; we use laser pulses at photonic nanostructures to look into novel concepts for particle acceleration. The main part of our laboratory is centered around light-matter interaction on fastest time scales, namely the femtosecond and attosecond time scale (1 fs = 1 millionth of a billionth of a second, 1 as = 1 billionth of a billionth of a second). This allows us, to put it a bit more abstractly, to work towards understanding und utilizing photon-electron coupling in various systems. 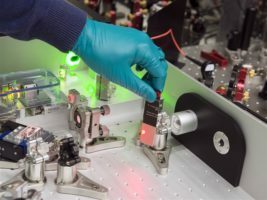 A part of this is based on highly advanced methods to control electrons, often with light fields, which requires building new laser sources and amplifiers.